Section 44 of the Interim Constitution of 2014 (the “Interim Constitution”), which was promulgated by the National Council for Peace and Order (NCPO) on 22nd July 2014, has been heavily criticized for its dictatorial nature and the absolute power solely consolidated into the Head of the NCPO. The main concept of Section 44 is that in any case deemed necessary by the Head of the NCPO, with the approval of the NCPO, the Head of the National Council for Peace and Order shall, as authorized, issue an order, restrain or perform any act regardless of whether such act enters into legislative, executive or judicial force. In this regard, all orders, acts as well as performance in compliance with such orders shall be deemed lawful and constitutional. Since the Interim Constitution has governed Thailand for a substantial period of time, the Head of the NCPO’s unchallengeable power also has been kept under observation, by stakeholders. The question of ‘when and how the Section would be exercised’ had remained mysterious among public. Finally, before the end of 2014, the Head of the NCPO issued his first order. In April 2015, the NCPO lifted martial law and issued Order No. 3/2015, by virtue of Section 44, to replace it. 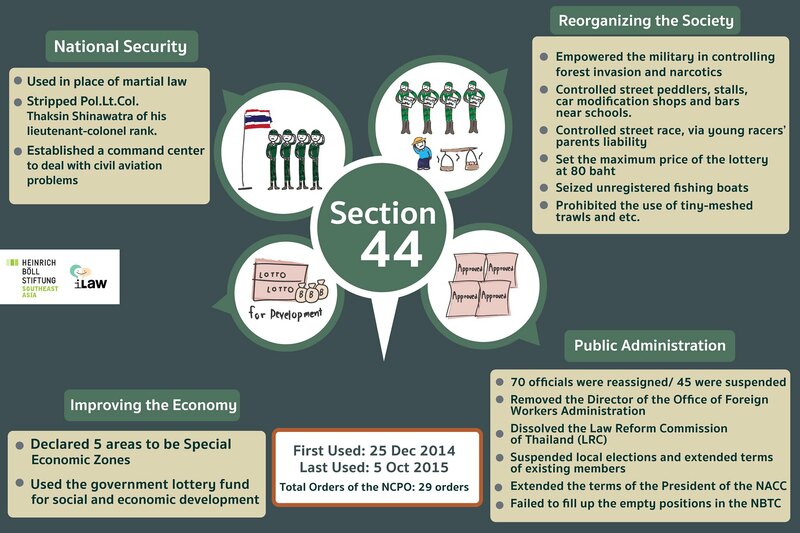 Since then, Section 44 has become a beneficial tool utilized by Prime Minister Prayut Chan-o-cha in issuing numerous orders. The orders issued under Section 44 include transferring officials to solve administrative problems in the Ministry of Education, solving the problem of migrant workers, omitting the appointment of the National Broadcasting and Telecommunication Commission (NBTC), enacting measures and policies on the utilization of public land, improving the administration of the Ministry of Education, solving the problem of illegal, unreported and unregulated fishing, solving the problem of overpriced lottery tickets and appointing the selection committee of the National Anti-Corruption Commission (NACC). 25th December 2014 – The Head of the NCPO issued Order No. 1/2014 under Section 44 of the Interim Constitution, to temporarily change the nomination process of members of local councils and local administrators. Previously, the NCPO issued Announcement No. 85/2014 to discontinue the election of members of local councils and use the method of nomination in its place. However, Order No. 1/2014 stipulates that members of local councils in local administration organizations who are to be discharged from their positions upon the completion of term shall remain in their positions to continue carrying out their duties. In the case where members of local councils are discharged from their positions for a reason other than the completion of term, the local councils shall maintain the current number of members. It is not required to nominate additional members to fill the vacant positions unless the remaining number of members is less than one half of the total number of members of local councils required by the Law on Establishment of Local Administration Authorities. In this respect, an appropriate number of individuals must be nominated to become members of local councils in accordance with Announcement No. 85/2014. As the aforementioned order does not enter into force in Bangkok and Pattaya, members of local councils and local administrators in local administration organizations in both cities that were nominated in accordance with Announcement No. 85/2014 shall continue carrying out their duties. After lifting martial law on 1st April 2015, the Head of the NCPO issued Order No. 3/2015 under Section 44 of the Interim Constitution, which concerns the maintenance of public order and national security, for the purposes of preventing and suppressing acts that undermine public order and national security. Under such order, peacekeeping officers have the duty to suppress offences relating to national security, and violations of announcements and orders issued by the NCPO. In this regard, peacekeeping officers are given the power to interrogate, arrest and summon any individual to report to them. 8th April 2015 – The Head of the NCPO issued Order No. 4/2015 under Section 44 of the Interim Constitution, which concerns measures that enhance the efficiency of law enforcement in protecting public interests. Examples of measures under the order are measures that prevent the encroachment on public land, national forests, and national parks, and measures that prevent the exploitation of public areas that obstructs traffic. 10th April 2015 – The Head of the NCPO issued Order No. 5/2015 under Section 44 of the Interim Constitution to make amendments to Order No. 3/2015. Order No. 5/2015 amends the definition of "Assistant Peace Keeping Officer" to become more inclusive. The term previously referred to military officers of a lower rank than a Lieutenant, or Midshipman or Pilot Officer, who are appointed by the Head of the NCPO. Under Order No. 5/2015, the term also refers to regular military personnel, military recruits and ranger volunteers. 16th April 2015 – The Head of the NCPO issued Order No. 6/2015 under Section 44 of the Interim Constitution. Under the order, six officials in the Ministry of Education were transferred for the sake of education reforms and the efficiency as well as appropriateness in the administration of the ministry. On the same day, Order No. 7/2015, which concerns the restructuring of administrative power of organizations under the Ministry of Education, was issued. The target organizations are board members of the Teachers Council of Thailand, the Welfare Promotion Commission for Teachers and Educational Personnel, and the Business Organization of the Office of the Welfare Promotion Commission for Teachers and Educational Personnel. This is for the benefit of the education reforms and efficiency in the admistration of the ministry. 23rd April 2015 – The Head of the NCPO issued Order No. 9/2015 to discharge Mr. Pichit Nilthongkham, an official of Chonburi provincial employment center, from the position of the Director of the Office of Foreign Workers Administration for the purpose of solving the problems in migrant workers and human trafficking with increased efficiency. 24th April 2015 – The Head of the NCPO issued Order No. 8/2015 to direct the National Broadcasting and Telecommunications Commission (NBTC) to refrain from nominating any individuals to fill the vacant position and become a member of the NBTC. The order was issued after the National Legislative Assembly reached a resolution to refuse to select one nominee from the four nominees suggested by a government selection committee. Upon the NLA’s refusal, the issue was brought to Cabinet for its consideration, in which the Cabinet pointed out that it was inappropriate for the Cabinet to select any individuals other than those on the list of nominees to take up the position. 29th April 2015 – The Head of the NCPO issued Order No. 10/2015, which concerns solutions to the problem of illegal, unreported, unregulated fishing. Under the order, the “Command Center for Combating Illegal Fishing” (CCCIF) is established as an ad-hoc center that reports directly to the Prime Minister. The Navy Commander-in-Chief was appointed as the Commander-in-Chief of the CCCIF. The order is issued in order to solve the problem specified in the warning issued by the European Union, and to implement measures of prevention, suppression and eradication of illegal, unreported and uncontrolled fishing. 1st May 2015 – The Head of the NCPO issued Order No. 11/2015 to implement measures that solve the problem of overpriced lottery tickets. Under the order, all board members of the Government Lottery Office (GLO) were removed from their positions. The appointment of board members of the GLO will not be actualized until the Head of the NCPO orders otherwise or NCPO ceases to exist in accordance with the provisions of the Constitution. In addition, the order imposes penalties on those selling lottery tickets higher than the stated price, where violators risk a maximum imprisonment of one month, a fine of no more than 10,000 THB, or both. The Navy Commander-in-Chief or the Commander-in-Chief of the First Army Region has been granted the power to prevent and suppress acts that are deemed as offences under the Law of the GLO. Moreover, on 2nd May 2015, the Head of the NCPO issued Special Order No. 1/2015 by virtue of Order No. 11/2015 to appoint Major-General Apirach Kongsompong as the Chairman of the GLO. 8th May 2015 – The Head of the NCPO issued Order No. 12/2015 to direct Mr. Panthep Klanarongran, the Chairman of the National Anti-Corruption Commission of Thailand (NACC) who is to be discharged from his position upon reaching the age of 70, to remain in his position until 21st September 2015 in order for him to complete his term along with four other board members. On the same day, the Head of the NCPO issued Order No. 13/2015, which concerns the nomination of board members of the NACC. Since the position of the Leader of the Opposition in the House of Representatives remains vacant and the President of the Supreme Administrative Court cannot carry out his duties, a nomination committee of the NACC could not exist. In this respect, the order made amendments to nomination committee of the NACC to include representatives from the executive branch in an effort to represent all three branches of government. A Deputy Prime Minister assigned by the Cabinet will be a member of such nomination committee. 15th May 2015 – The Head of the NCPO issued Order No. 16/2015, which concerns measures that solve the problem of officials under investigation and assigns temporary positions. The order was issued to suspend 45 officials, those suspected of corruption and misconduct. On the same day, the Head of the NCPO issued Order No. 17/2015, which concerns finding and providing land to utilize in Special Economic Zones. The Head of the NCPO exercised his power under Section 44 of the Interim Constitution to expedite the process of acquiring the land necessary to utilize in the Special Economic Zones by turning them into Ratchaphatsadu Land or immoveable property of State, resulting in the cancellation of prior conditions of the land. 22nd June 2015 – The Head of the NCPO issued Order No. 18/2015 in order to allow committees under the certain laws to be able to continue working. The order was to empower agents or caretakers of different boards, including that of state enterprises, public agencies, and university councils to have equal power to their principals in order for the work to be done without difficulties. 25th June 2015 – The Head of the NCPO issued Order No. 19/2015, which concerns the assignment of new positions to officials. The order was issued in order to assign new positions to 60 officials, including provincial administrative authorities, Mayors, Chief Executives and Deputy Chief Executives of Sub district Administrative Organizations, and Chief Executives of Provincial Administrative Organizations. 15th July 2015 – The Head of the NCPO issued Order No. 20/2015, which concerns the suspension of the process of finding and selecting individuals to be nominated as committees of the Law Reform Commission of Thailand (LRC). The order was issued in order to suspend the process of finding and selecting new committees of the Law Reform Commission, and also to remove committees that have terminated their terms from the office. During the period when there are still no committees, the Law Reform Commission Office are assigned to assist the work of the Council of the State. 21st July 2015 – The Head of the NCPO issued Order No. 21/2015, which concerns the appointment of new position and assigning an official to the position. The order was to reassign the position of the Deputy Secretary-General of the National Security Council. 22nd July 2015 – The Head of the NCPO issued Order No. 22/2015, which concerns the measures of preventing and solving the problems of the racing of cars and motorcycles on the streets, and controlling entertainment spots and places of the same manner. The order is to prohibit gatherings, which have the purpose of car racing. Parents are also bound to prevent their children from gathering. If any minor commits the offense, his parents shall be notified. If the offense is repeated, the parents shall be liable to a maximum of 3 month-imprisonment and a maximum fine of 30,000 baht. The Order also prohibits vehicle modifications in the manner for racing and so on. 23rd July 2015 – The Head of the NCPO issued Order No. 23/2015 about the measures to increase efficiency in the enforcement of the Narcotics Control Act B.E. 2519. The military can come to the aid, when the Ministry of Justice has requested the military to do so and give the authority to the military to search the vehicle at the suspect’s residence and can arrest the suspect not exceeding 3 days. 5th August 2015 – The Head of the NCPO issued Order No. 24/2015 about the settlement of illegal, unreported and uncontrolled fisheries. The order was issued to refrain from ship registration in accordance with the term the commanding center of the settlement of illegal fisheries had announced, prohibit certain types of fishing tools such as push nets, fish trap, purse seine, etc. and to give the authority to the officials to seize illegal tools and ships. Whoever violates the regulation shall be imprisonment not exceeding five years or a fine not exceeding five hundreds thousand bath. 10th August 2015 – The Head of the NCPO issued Order No. 25/2015, which concerns the amendment of the Head of the NCPO. The objective of the spending of The Government Lottery funds for social development is to allow the government to use the fund for the implementation of the government policies for the benefit of the economics and societies. 5th September 2015 – The Head of the NCPO issued Order No. 26/2015 about stripping Police Lieutenant Colonel Thaksin Shinawatra from his police rank after he had been sentenced guilty in a final judgment and was charged with several criminal offences. 11th September 2015 – The Head of the NCPO issued Order No. 27/2015, which concerns the settlement of regulation and development of Thailand Civil Aviation. The order was issued in order to establish “Command Center for Resolving Civil Aviation Issues” or CRCA. The ad hoc center will be under the command of the Head of the NCPO by having the Commander-in-Chief of the Air Force as the Armed Forces Headquarters. Its structure is a committee to resolve civil aviation issues, in order to stipulate policies for the method for plan of action and to give consent to the plan of action for amendment, adjustment and development of the Civil Aviation in accordance with the universal standard including command, control, monitor and examine operation, which deals with resolving the issues of civil aviation. Moreover, it is also stipulated that the committee of CRCA and the official of CRCA that perform in accordance with function within the authority, in good faith, with no discrimination, and not beyond reasonable or beyond necessary shall not be held liable under civil liability, criminal liability, disciplinary or administrative due to the duty to resolve civil aviation issues concerning this order. Nonetheless, this doesn’t deprive the right of the victim to claim compensation from government service in accordance with the law, which deals with tort liability of the officer. 16th September 2015 – The Head of the NCPO issued Order No. 28/2015, which concerns the president of the National Anti-Corruption Commission to continue his duty. According to the order, Mr. Panthep Klanarongran is instructed to continue to carry out his duties as the president of the National Anti-Corruption Commission until a new president is appointed. On the same day, the Head of the NCPO issued Order No. 29/2015, which concerns filling vacant positions in the State Audit Commission (SAC) and finding officials to take positions in the Independent Organization. Due to the resignation of the commissioners in the State Audit Commission, the numbers of the commissioners left were less than the number required by the law; the remaining commissioners hence were unable to carry on with their duties. Therefore, the SAC was to have at least five commissioners and if not, the Auditor General of the Office of the Auditor General of Thailand would fill in the role of the SAC. This order was issued to facilitate the work of SAC. 22nd September 2015 – The Head of the NCPO issued Order No. 31/2015, which concerns appointing positions and assigning civil servants to roles. Under the order, Mrs. Kanokthip Ratchatanant was instructed to step down from her position as the Deputy Secretary General of the National Security Council (NSC) and take the position as a special qualified publicist in the field of strategy and security carrying out duties related to strategy and security and other duties. In addition, Office of the Permanent Secretary Prime Minister Office, Office of the Civil Service Commission, Bureau of Budget, Office of the National Security Council, and other related agencies are to be responsible for the determination of position, salary rate and privileges of such civil servant. On the same day, the head of the NCPO issued Order No. 32/2015, which concerns appointing the Director of the Office of SMEs Promotion (OSMEP). Under the order, Mrs. Salinee Wangtal is appointed as the Director of the Office of SMEs Promotion (OSMEP) with the term of office of two years from the day the order comes into effect and if it seems necessary, a suggestion may be presented to the Prime Minister to order either the extension of such term of office to a reasonable period of time but not exceeding two years or a discharge from the office. When the NCPO ceases to be in power, the Director of the OSMEP appointed by the order shall also be discharged. 5 October 2015, The Head of the NCPO issued Order No. 34/2015 which concerns the facilitation for the preparation of constitution drafting. Under the order, the measures to facilitate the preparation of constitution drafting and other preparations are put in place. Examples of the preparations are public hearings, referendum and preparation of organic laws. Furthermore, the Constitution Drafting Committee can have no more than nine consultants, taken into consideration from those who were drafting committee members of the 1997, 2007 and 2014 Constitutions. Further, in order to perform their tasks, members of the National Reform Steering Assembly shall have assistants. Committee and selection of the positions in independent organizations shall be enforceable from 20 August 2015 instead of the date that the order was announced in the Royal Gazette. 15 October 2015, The Head of the NCPO issued Order No. 37/2015 which relates to the additional assignment of positions and appointment of civil servants. Under the order, the consultant to the Office of Prime Minister is appointed. Mr. Jaray Panpleung shall be dismissed from the secretariat of the House of Representatives and will take this consultant position, while Mr. Nath Phasuk shall replace him. 18 October 2015, The Head of the NCPO issued Order No. 38/2015 which amends Order No. 37/2015. Order 38/2015 revokes the additional assignment of positions and appointment of civil servants. It shall be deemed that Mr. Nath Phasuk has never been dismissed from the position of legal advisor of the Office of Secretariat of the Senate and has never been appointed as the secretariat of House of Representatives. This order shall not have any effect on what he had conducted as the secretariat of the House of Representatives. 30 October 2015, The Head of the NCPO issued Order No. 39/2015 which relates to the protection of the management of remaining rice which is under the maintenance of the Government and the accountability of those who are responsible. Under the order, any personnel or office, who has been appointed by law or assigned by the NCPO or the Committee of Policy for Rice Management to manage rice which is under the maintenance of the Governement under the rice subsidy programme since the production year of 2005/2006 until 2013/2014, shall have the same authorities and responsibilities. So long as the persons above have performed their duties with good faith, they shall be protected and will not be held accountable for civil, criminal or disciplinary action. 5 November 2015, The Headof the NCPO issued Order No. 39/2015 which relates tothe temporary establishmentof the Social Security Committeeand appointment of consultants for theSocial Security Committee, the Medical Committee, the Workmen’ Compensation Fund. Under the order, their functions shall be ceased. The order also suspends the selection process forCommittee and Medical Committee under the law. Suitable persons shall be appointed for these positions. 11 November 2015, The Head of the NCPO issued Order No. 41/2015 which concerns the facilitation of national reform. Under the order, the Office of the Secretariat of the House of Representative shall work as an administrative office for the National Reform Steering Assembly. It is responsible for budgeting, venue, staff and facilities for members of the National Reform Steering Assembly (NRSA) as determined by the President of the NSRA . On the same day, the Head of the NCPO issued Order No. 42/2015 which concerns the second amendment of the resolution for illegal fishing, and lack of both report and control. Under the order, officers shall improve the database for registration of new boats to conform withactual circumstances. 8,024 boat registrations shall be withdrawn from the boat registration for fishing. The issuance of license for fishing equipment shall be controlled in proportion to the number of marine creatures. 25 November 2015, The Head of the NCPO issued Order No. 43/2015 which transfers the Office of the National Water and Flood Management Policy which is under the Office of Permanent Secretariat to be under the Secretariat Office of National Committee of Water Resources, Department of Water Resources. The objective of this transfer is to make the Department of Water Resources the main office responsible for resolving and managing overall water problems of the country. 4 December 2015, The Head of the NCPO issued Order No. 44/2015 which concerns the resolution of problems relating to human resource management by the police department. Under the order, the Office of Police Commission shall be the office which provides for the the rules, appointment process and transfer process forthe police department. Moreover, the Commissioner General shall have the power to consider its next successor and propose it to the Board of Royal Thai Police to consider following which the appointment shall be made by the King. For the position one rank below that of the the Commissioner General, the Commissioner General shall select from a list of police officers and propose a name to the Office of Police Commission to approve. Following approval by the Office of Police Commission, that person shall be appointed by the King. In the case that the Commissioner General believes that the appointment to commissioner positions is unfair, or that the process is not in accordance with the rules and methods established by the Office of Police Commission, or if the Commissioner General considers that if such person continues to hold a position, it will cause damage to government service, or if there are special causes indicated by the Office of Police Commission, the Commissioner General shall have the power to appoint a police officer to hold certain position on a case-by-case basis. 9 December 2015, The Head of the NCPO issued Order No. 45/2015 which concerns the selection of the President of the National Anti- Corruption Commission (NACC). Under the order, Mr. Paantep Klanarongraan will be dismissed from the position of NACC President after his term has come to an end; his term had previously been extended by NCPO Order No. 28/2015. The Office of NACC shall organize a meeting among the committee members approved by the National Legislative Assembly (NLA) and the committee members whose term has not come to an end. The President of the NLA shall be informed of the outcome of the meeting. 10 December 2015, The Head of the NCPO issued Order No. 46/2015 which concerns measures for problems from driving/riding vehicles. The order states that gatherings that lead to car or motorbike racing shall be punished according to law on land transport. Where a person driving or riding a vehicle that transports passengers in a negligent manner or with alcohol level exceeding the limit and causes injuries, the authority could forfeit a driver’s license for three days. The authoritycould also temporarily keep the vehicle for seven days and detain such person for behaviour training for not less than seven days. On the same day, the Head of the NCPO issued Order No. 47/2015 which concerns the appointment to the Board of Investment (BOI). Under the order, it appointed Mr. Prasarn Trairatworakul as an advisor to the BOI. Mr. Prasarn has replaced Mr. Tewin Wongwanich who had resigned. 31 December 2015, The Head of the NCPO issued Order No. 48/2015 which appoints the Committee of SMEs Promotion (ad hoc). The subject matter of the order is the change of committee in the Committee of SMEs Promotion (ad hoc). Four people, including Mr. Somphob Manarangsan, Mr. Sirichai Lertsirimitr shall be removed from the position.. Four people, including Mr. Khobsak Phutrakul and Colonel Jiaranai Wongsa-ard, shall be appointed. 5 January 2016, The Head of the NCPO issued Order No. 1/2016 which concerns the third additional list of States’ officials who are in the process of being investigated. The order suspends 59 states’ officials which include the managers of educational institutes, civil servants, executives and civil servants of the Local Administration Office and the Committee of Thai Health Promotion Foundation. They are being investigated by the authorised office as to whether they have been involved with corruption. 18 January 2016, The Head of the NCPO issued Order No. 2/2016 which concerns temporary resolutions to the performance problems of the Committee of Thai Health Promotion Foundation. This order allows the remaining committee to continue working. Earlier, the Head of NCPO issued an order to remove seven competent committee members from the position. Consequently, the composition of Committee was incomplete and a meeting could not be held. The order states that 1. the selection and appointment of vacant members of the Committee of Thai Health Promotion Foundation shall be held immediately. 2. During the selection and appointment process, the remaining committee may continue to perform its functions. Mr Chamnan Pichetpan shall temporarily be second vice president. 3. The Committee under 2. shall continue to perform until the new Committee has taken its position. 20 January 2016, The Head of the NCPO issued Order 3/2016 which concerns the exemption of the enforcement of laws on city planning and laws on building control in the Special Economic Zone(SEZ). This order has resulted from the the government’s policies to promote SEZ. Nonetheless, the rules on how to utilize land under laws on city planning and laws on building control are inconsistent and obstruct the establishment of SEZ. Therefore, this order will allow such establishment and management of the SEZ to be expedited. This order facilitates investment by decreasing legal limitations, such as location of industrial factories. Previously, certain prohibitions under those laws applied on the land declared as SEZ; certain factories could not be built. However, this order will lead to ministerial regulations on city planning and to new regulations on building control which will facilitate the SEZ policy and investment conditions. On the same day, the Head of the NCPO issued NCPO Order No. 4/2016 which exempts the implementation of ministerial regulations on general city planning for certain enterprises. The rationale of this order is to restrain and to fix some legal objections obstructing the State’s attempt to urgently fix problems on energy security in Thailand and on the environment, especially excessive garbage. The order is also for the development of the national economy and to get the country ready for the ASEAN Economic Zone. This order reduces legal limitations on factory location or other enterprises related to energy production and waste management. Previously, there may have been/ would have been certain prohibitions under ministerial regulations on city planning applying in certain districts or provinces. Consequently, the authority may not approve the enterprises according to (1)-(8) in some areas; for example, the rural and agriculture reservation area with the regulation that prohibits the building of power plants. Thus, with this order, the authority may approve the enterprises (1)-(8) without having to consider laws on city planning which is a crucial measure to protect the environment. 1 February 2016, The Head of the NCPO issued NCPO Order No. 5/2016 which concerns the measures to improve efficiency of public administration. This order improves the efficiency of public administration in order to be consistent with the Country’s reformation. It indicates an evaluation and the high rank civil servants from department and ministry levels who will be evaluated. The Office of the Public Sector Development Commission, in a special case, shall increase 50 more positions in case the civil servants have been transferred, investigated and found guilty. 5 February 2016, The Head of the NCPO issued NCPO Order No. 6/2016 which concerns the selection and appointment of police. The selection and appointment that have been arranged according to Royal Thai Police Act 2004, related NCPO orders and orders of the Head of NCPO since 22 May 2014 until the date that this order is issued, shall be deemed legitimate. The Head of the NCPO issued NCPO Order No. 7/2016 which concerns the assignation of police positions with investigation power. The order annuls all investigator positions according to section 44 and 47 of the Royal Thai Police Act 2004. The order also annuls the remuneration of investigators according to section 72. The rank of investigators to specialist investigator shall be transferred to be deputy inspector to deputy superintendent inspector respectively. It also indicates that the positions of investigator expert shall be transferred to be superintendent (lawyer) and deputy commander (lawyer). 12 February 2016, The Head of NCPO issued Order No. 8/2016 which concerns the general management of public and private vocational institutes. The order transfers monitoring authority that was previously under Office of the Private Education Commission to be under Vocational Education Commission. The purpose is to reform education and the management of the Ministry of Education (MOE) so that they are consistent with the policy of the MOE. 21 March 2016, The Head of the NCPO issued Order No.10/2016 which concerns steering reform of education of Ministry of Education in provincial areas. The order appoints the Committee to Reform Education of Ministry of Education in provincial areas. The Minister of Education shall be president of the committee and play a role in specifying the direction of the Ministry’s work in regional or provincial areas. The Minister will also plan the management of human resources, consider the budget allocation, appointment, transfer and move the executives of education institutes/ education service areas/ officers in positions in the region or province. Moreover, committees of education service areas, sub-committees on teachers and educational personnel and education service areas shall be abolished. The authority shall be transferred to Committee on Provincial Education which is appointed in the order. Such Committee shall have responsibility to indicate strategies, approaches to manage education at all levels in the province and shall have the authority to appoint the sub-committee. On the same day, the Head of the NCPO issued Order No. 11/2016. It concerns the administration of Ministry of Education in the regions. The provincial and regional education shall be established to implement missions of the Ministry in the local levels, to specifying strategies, to support provincial development and to coordinate administration between the center and the regions. This order transfers responsibilities of directors of primary and secondary education service area, in particular the work of teachers and educational personnel and education service areas, to be responsibilities of provincial education. 29 March 2016, The Head of the NCPO issued Order No. 12/2016 which concerns the appointment and transfer of important civil servant positions such as Provincial Governor of Srisaket, Tak, Chandraburi and Pattani. Furthermore, the inspector of Ministry of Transport will take the position of Director-General of Harbour Department. The Royal Gazette website has published NCPO Order No. 13/2016 which concerns the prevention and suppression of specific offences which are dangerous to peace and sabotage the economy and society of the country. The Order authorizes officials to arrest any person who commits a flagrant offence, to search, to seize and to detain any person for no more than seven days. The Order also allows officials to set release conditions. More importantly, this Order grants an immunity to the military and removes the power of the Administrative Court to monitor and check detentions. The Order indicates that it will apply to any person who abuses, bullies, or threatens other people so that they do not dare to resist and to file a complaint to the authority. The Order also applies to those people who make a living from illegal action such as drug dealers, gamblers, and those people who collect weapons. 5 April 2016, the Royal Gazette website has published NCPO Order No. 14/2016 which establishes an advisory committee for the administration and development of southern border provinces. It also concerns the assignment of power of the Internal Security Operation Center. The Order establishes an advisory committee for the administration and development of southern border provinces made up of not more than 60 people. The Committee will replace the SBPAC, which is made up of locals elected from the community. The Order also states that the Secretary of SBPAC shall take advice from ISOC secretariat. 11 April 2016, the Royal Gazette website has published NCPO Order No. 15/2016 which makes allows migrants from Myanmar, Laos and Cambodia to return to their country of origin for Songkran holidays of 2016. According to the Order, migrants from Myanmar, Laos, and Cambodia may return to their country for the Songkran festival. They will not be considered to have travelled outside the province that they have registered themselves in, or where they are allowed to work, on the condition that they return to Thailand before 20 April 2016. Officials are prohibited from using their power to obtain money from such returning migrants. 12 April 2016, the Royal Gazette website has published NCPO Order No. 16/2016 on the auction of the telecommunication frequency. Under the Order, the NBTC will organize the auction event for frequency 900 megahertz, radio frequency 895-905 megahertz together with 940-950 megahertz on 27 May 2016. The auction shall be open for general licensees except those who have violated or have not complied with NBTC announcements. For the first round of auction, the price has been set at 75,654 millions baht and the deposit has been set at 3,783 baht. When a concession license or mobile phone provider contract (No.2) has ended, temporary protection shall apply until 30 June 2016 or until the NBTC issues a license for a frequency to those who win the auction. 21 April 2016, the Royal Gazette website has published NCPO Order No. 1682016 on the amendment of NCPO Order No. 10/2015. This Order amends section 9 of NCPO Order no. 10/2015 which concerns resolutions about illegal fishing and the lack of reporting and monitoring. For any important matters concerning government policy and which may have wide effect, the Command Center for Combating Illegal Fishing (CCCIF) shall seek the opinion of the steering committee no.5 before proposing them to the Prime Minister. However, for a general matter, the CCCIF shall seek the opinion of the same steering committee before the Commander has made a decision. On the same day, NCPO Order 19/2016 was published. The Order amends NCPO Order 27/2015. Order 19/2016 revokes section 4 of Order 27/2016 on whether the Committee of Command Center for Civil Aviation has complied with its authority and duty. If any important matter concerns policies of the Government and has wide effect, the Center should seek the advice of the 5th committee before proposing to the Prime Minister to issue an order. For general matters, the Center should seek the advice from the same Committee before the Commander of the Center issues an order. They shall take the position of Special Inspector General in the Office of Prime Minister. Tawut Suraban, Vice Provincial Governor of Rachaburi shall be the Provincial Governor of Srisaket. Chareonrit Sagnuansut, Vice Provincial Governor of Lumpoon shall be the Provincial Governor of Tak. Witurat Srinam, Vice Provincial Governor of Pitsanulok shall be the Provincial Governor of Chandaburi. Suriya Amornrodworawut, shall be dismissed from the position of Inspector General of the Ministry of Interior and shall be the Provincial Governor of Srisaket. 26 April 2016, the Royal Gazette website published NCPO Order 21/2016 which concerns the performance of the Royal Thai Police. The NCPO issued this order under section 44 of the Interim Constitution of Thailand. According to the Royal Thai Police Act 2003, the Commander of the Royal Thai Police shall appoint police positions. The Act has been amended by NCPO Order 44/2015 dated 5 December 2015 on how to solve problems of human resources management of police institute. From the day that this Order comes into force until the appointment of police officers in the year of 2016 has finished, all appointments should be made according to the rules and directions established by the Commander of the Royal Thai Police for the time being. 4 May 2016, the Royal Gazette website has published NCPO Order 22/2016 which concerns a temporary selection of local council members in case the local council is dissolved. This Order changes the structure of the selection committee for local council members according to NCPO Order No. 84/2014 so that the committee structure will comply with principles of good governance, impartiality and share the same standards. The selection committee shall be comprised of the Permanent Secretary and Vice Permanent Secretary of the Ministry of Interior, head of community development and promotion of local administration group, Director-General of Local Administration Department, Community Development Department, Lands Department, Department of Disaster Prevention and Mitigation, and Public Works,Town and Country Planning Department etc. When the local council of any province is dissolved, the Provincial Governor shall propose a list of people who may be selected as council members. The number of people proposed shall be three times the number of actual local council members. The list shall be passed on to the selection committee within 15 days after the council is dissolved. Once the selection committee has received the list of people, the committee shall select members of the local council within 30 days from the day it receives the list from the Provincial Governor. 16 May 2016, the Royal Gazette website has published NCPO Order 23/2016 which concerns the performance of the Director of the Office for National Education Standard and Quality Assessment. Under this Order, Mr. Channarong Pornrungrod, Director of the Office for National Education Standard and Quality Assessment (Public Organization) was temporarily restrained from performing his duty. Mr. Komsorn Wongraksa, Vice-Director of the Office for National Education Standard and Quality Assessment (Public Organization) shall act for him until the Head of NCPO has states otherwise. 17 May 2016, the Royal Gazette website published NCPO Order 24/2016 which concerns the appointment of civil servants. Under this order, Police General Chaiya Siri-umpunkul is removed from the position of Police Inspector General of the Royal Thai Police. He is transferred to be a secretary of the Money Laundering Prevention and Suppression Committee, Office of Money Laundering Prevention and Suppression. The position of secretary does not need to be selected. He shall perform duties from the day that this Order comes into force and the National Legislative Assemble shall approve the transfer on behalf of the Senate. 31 May 2016, the Royal Gazette website has published NCPO Order 25/2016 which concerns the revocation of the prohibition on certain people from travelling abroad. This Order revoked NCPO Order No. 19/2014 which prohibited certain persons from travelling abroad. However, those subject to NCPO Order No. 39, 40 and 41/2014 or those people who violate NCPO Order 3/2015 still need to obtain approval from NCPO Order before travelling outside the country. 10 June 2016, the Royal Gazette website has published NCPO Order No. 26/2016 which concerns the provision of land to be used for residence development. The development project attempts to solve the problem of people trespassing public waterways. Under this Order, 30 square rai area of Chiangrakyai Canal in Khlongnueng Sub-district, Klongluang District, Pathumthani Province (according to the map annexed in the Order) shall be Ratchaphatsadu land. As a consequence, the area is no longer public property that people can share and utilize. In addition, the Treasury Department will allocate the use of this land to the cooperative established by “Pathumthani Model Project” to utilize according to the project. On the same day, the website published NCPO Oder 27/2016 regarding measures to prevent and to alleviate those who are distressed from the release of fireworks, skyrocket, fire balloons or other objects of a similar nature. The Order prohibits the release of these objects into the air unless permission has been obtained from the District Director for Bangkok and the District Sheriff for other provinces. The province shall have a provincial announcement which is agreed among the provincial committee and provincial cultural committee. For Bangkok, local legislation shall be enacted to establish measures. Whoever violates or does not comply with provincial announcements or Bangkok local legislation shall be imprisoned for not more than three years or fined not more than 60,000 baht or both. Bangkok legislation shall enter into force once it is published in the Royal Gazette. 15 June 2016, the Royal Gazette has published NCPO Order 28/2016 on free basic education for 15 years. The relevant government offices involved in arranging basic education shall organize 15 years basic education from kindergarten (if any), elementary school until 12th grade or vocational certificate (vocational certificate 3) or equivalent. It also includes special education and welfare schools which have to meet certain quality and standard. The free fee covers (1) teaching (2) books (3) stationery (4) uniforms (5) student development activities (6) other expenses as deemed appropriate by the Cabinet. NCPO Order 29/2016 on the temporary selection of local council members or local executives in case a subdistrict administrative organization (SAO) has been upgraded to be a municipality or in case a municipality has changed its status. In case members of a local council or local executive position vacate before its term finishes, or if the SAO has been upgraded to municipality or the municipality has been upgraded, or in case their terms have come to an end and the SAO has been upgraded to be a municipality, a municipality has been upgraded or the position or municipality has changed, the selection for members of local council or local executive of SAO shall be conducted according to NCPO Order 85/2015 on the temporary selection of members of local council local executives. NCPO Order 30/2016 on measures on how to prevent and solve problems of quarrels and fights between students. Under this Order, officials in category 7 of the Child Protection Act 2003 shall have authority to detain students who fight or are prepared to do so. However, the detention cannot be more than six hours for the purpose of bringing the students to the police, school executives, parents or guardian depending on the case. The parents or guardians shall take responsibility in this case. Moreover, whoever instigates, promotes, assists or supports students to violate section 64 of the Child Protection Act 2003 shall be imprisoned for not more than three months or fined 30,000 baht or both. NCPO Order 31/2015 on the amendment of forestry law to prevent, restrain and to suppress illegal cutting of trees. The Order amends a few definition of the Forestry Act 1912; for example, it has defined ‘processed wood’ and ‘cutting wood’. NCPO Order 32/2016 is concerned with the prevention of smuggling of chemical products, substances and certain equipment. The secretary of drug prevention and suppression committee could seize smuggled chemicals, objects or other tools used to produce drugs. 24 June 2014, the Head of NCPO has used the power under section 44 to issue NCPO Order 33/2016 which concerns the transfer of 23 public servants to work in other offices. There had been complaints that they had been involved in corruption or misconduct or that they had been neglectful and allowed corruption or misconduct to have taken place. They are not dismissed from their office but only transferred to work in other office temporarily. 5 July 2016, the Head of NCPO has exercised the power under section 44 to issue four orders which are as following. - Narong Rattannukul shall be dismissed from secretariat position in the Office of Narcotics Control Board. He is now appointed as a Special Inspector General of Office of Prime Minister. - Pasith Aussawawattanaporn shall be dismissed from a director position in the Office of Justice Administration. He is now appointed as a legal advisor in the Office of Permanent Secretary of Justice, Ministry of Justice. - Wanlop Nakbua shall be dismissed from vice director position in the Office of Justice Administration. He is now appointed as a director in the Office of Justice Administration. NCPO Order No. 35/2016 concerns measures for the possession and use of land in Putubberg forest, Wangban sub district and Baannern sub district, Lomkao district. This is due to the fact that the land had been trespassed and possessed in violation of forestry law. The land was used to build hotels and resorts. Therefore, the NCPO Order indicates that the owners or possessors of buildings shall move out from the area within a given time. They also need to remove, destroy or conduct other acts in order that Putubberg will return to its original condition or as close to the original as possible. They shall be responsible for compensation or cost of removal. 2) Farmers possessing land who have been chosen under regulations of Agriculture Land Reforming Committee. NCPO Order 37/2016 concerns relevant expenses necessary to support and promote public health services and expenses according to the law on National Health Security. Under this Order, service networks, client referring units, community organizations, NGOs, Local Administration Organizations, and governmental offices assigned to work with similar authority of National Health Security Office according to the law on National Health Security, are entitled to receive relevant expenses necessary to support and promote public health service and other expenses from the National Health Security Fund. 13 July 2016, the Head of NCPO has exercised the power under section 44 to issue three NCPO Orders. NCPO Order 38/2016 has amended NCPO Order 10/2016 (the campaign of education reform of ministry of education in the region) and 11/2016 (administration of ministry of education in the region). The Provincial Education Committee shall propose to the Committee on the campaign of education reform of ministry of education in the region in order that the provincial subcommittee on education will be established. The subcommittee will assist or filter the work on admitting, appointing, transferring, conducting disciplinary action, setting up academic standing or any benefits for teachers and personnel of the government in the province to the Provincial Education Committee. Furthermore, the number of vice regional education and vice provincial education has been reduced to one position each instead of unlimited number. NCPO Order No. 39/2016 concerns the regulation on good governance problems in higher education. The Order states that in case the process of acquiring head of higher education council, committee members of the council or dean, causes conflicts and violates morality, the Minister of Education has the power to restrain the appointment or selection process of such positions. The higher education committee shall report to the Minister of Education in case they find out that any council of higher education institutes or education institutes 1) provides education that does not meet a standard of higher education 2) intentionally avoids or delays compliance with laws, regulations and rules of higher education or order of the Minister of Education. 3) the head of higher education institute council, committee of higher education institute council, or executives of higher education institute, potentially have corruption behavior 4) causes conflicts within higher education institutes and the higher education institute council or the institute cannot solve such conflict. The Minister of Education with advice from higher education committee, has power to order the council or institute to restrain in accepting students, close the programme, stop the curriculum or any other actions. NCPO Order No. 40/2016 has annulled NCPO Order 48/2014 dated 29 May 2015 concerning the selection of replacements for available positions. NCPO Order 40/2016 states that the selection of Constitution Court Justice, Electoral Committee, Ombudsman, National Anti-Corruption Committee and National Human Rights Committee shall be halted until the new Constitution of Thailand has entered into force or there has been a new order stating otherwise. 14 July 2016, the Royal Thai Gazette website has published NCPO Order 41/2016 concerning the monitoring of dissemination of information to the public. As the National Broadcasting and Telecommunications Commission (NBTC) had controlled and prohibited the broadcast of information or programmes with content to overthrow the democratic system with the King as head of state or content affecting national security, peacefulness and morale, the NBTC is protected from civil, criminal and disciplinary accountability. However, the damaged parties may file a complaint and claim for compensation from the governmental office under the Accountability for Infringement of Officials Act. 21 July 2016, the Head of NCPO has exercised his power under section 44 to issue two orders. NCPO Order 42/2016 concerns the project for the blue line for the sky train. The Order dissolves the selection committee for the blue line sky train project (the extension between Hualumpong – Bangkae and between Bangsue – Thapra). The Order also states that the Mass Rapid Transit Authority of Thailand (MRTA), instead of the selection committee, shall establish rules and finalize them within 30 days since the day that this Order has entered into force. The MRTA shall present them to the Minister of Transportation to consider. The Minister shall finalize the rules within 15 days after he has received them. The selection committee and monitoring committee, then, shall have a meeting together and finalize the rules within 30 days. They will negotiate with the concessionaire of sky train (Chalermrachamongkol line) to execute the extension parts in order that they would work continuously as one network. The negotiation and finalization of the contract shall be finished in 30 days. NCPO Order No. 43/2016 concerns the fourth list of government officials who are being scrutinized. The list is comprised of four categories of 60 people: 1. Executives of education institutes 2. Civil servants — both categories shall temporarily discontinue to perform their duties. For category 3, which are executives of local administration organizations, shall temporarily discontinue to perform their duties without compensation. For category 4, which are civil servants of local administration organizations, shall be transferred to work in other local administration organization that they did not previously work for. In addition, the Order states that the original affiliation organizations shall immediately establish committee to scrutinize or investigate officials for disciplinary action. In case where the committee does not find an official guilty, or finds that his/her action was not corrupt, he/she should return to the original position and the original affiliation organization shall report to the Prime Minister to consider further change to its order. 26 July 2016, the Head of NCPO issued Order No. 44/2016 on the fifth list of government officials who are being scrutinized. As the referendum is on 7 August 2016, the authority has found that executives and government officials of some local administration organization may have violated referendum law. Therefore, in order to prevent unrest, Mr. Boonlert Buranupakorn, Chief Executive of Provincial Adminitrative Organization of Chiangmai shall temporarily discontinue to perform duties without receiving compensation. The legal prosecution or scrutiny shall be conducted immediately. The finding shall be reported to the Prime Minister. 31 July 2016, the Head of NCPO has exercised his power under section 44 to issue two orders. NCPO Order 45/2016 concerns an extension of the timeframe to submit income tax of legal person according to State Revenue Code so it is fair for investors. The timeframe has been extended to 15 August 2016. As a result, companies and legal persons do not have to pay fines. The timeframe to request for a return fine shall also be extended to 15 August 2016. NCPO Order No 46/2016 has amended Order No. 2015. The Order states that if any entertainment places, by consent or negligence, allows human trafficking or gambling at their place, the authority may revoke their licence or order them to shut down their place for five years. If that place is in the progress of extending their licence, their licence will not be extended. Furthermore, a licence will not be given to them for a duration of five years. The Order also adds section 6/6 which states that whoever opens an entertainment place within five years since the order to revoke their licence or order to shut down their place and whoever opens an entertainment place to sell alcohol with a location that is close to schools, universities or dormitories, shall be imprisoned not more than one year, or fined not more than 20,000 baht or both. 18 August 2016, the Head of NCPO issued two orders. NCPO Order No. 47/2016 concerns actions following NCPO Order 33/2016 dated 24 June 2016 which transferred civil servants to work in other organization. The transfer of Samutprakan Governor, prosecutors, and police in the area of Samutsakon Province resulted from criticism of human trafficking. If the finding shows that they are not guilty or disciplinary action was not necessary, supervisors of the persons being investigated shall report it to the National Anti-Corruption Center. The investigation is yet to be finalized. The Center shall set up a committee with 3-5 people to compare the finding of supervisors and report of evidence. The committee is authorized to ask people to come and give statements. However, the committee shall finish the process within 30 days after it is established. NCPO Order No. 48/2016 concerns an improvement of human resource management in some government offices. The Order states that Mr. Chula Sukmanob, Director-General of Department of Civil Aviation, Ministry of Transportation shall be dismissed from his position. He shall take a director position in the Civil Aviation Authority of Thailand according to Civil Aviation of Thailand Decree 2015 from 1 October 2016 which is on the same day that the former Director of Civil Aviation Authority of Thailand resigns due to health reason. 22 August 2016, Head of the NCPO has issued NCPO Order No. 49/2016 on measures of patronizing and protecting religions in Thailand. The Order states that the patronization and protection of all religions are duties of all government offices. The offices shall support and disseminate correct teaching of each religion. They also have to set up measures to encourage understanding between all religious followers and measures to prevent sabotage of Buddhism and other religions. The government offices shall additionally provide information to foreigners on what to do and not do in each religion. The measures shall be presented to the Cabinet in three months. The National Office of Buddhism and Department of Religious Affairs shall report the updates on implementation of this order to the Prime Minister every three month. 25 August 2016, the Head of NCPO issued Order No. 50/2016 on the sixth list of government officials who are being scrutinized. The Order states that Momratchwong Sukhumbhand Paribatra, Governor of Bangkok and Mr. Premsak Piayura, Mayor of Muangbaanpai, Baanpai District, Khonkean Province shall halt their duties. However, they are not yet dismissed from their position until there is an order stating otherwise. In the meantime, they do not receive any salary. NCPO Order 51/2016 concerns the process to be followed for objects kept in tax free areas and free trade areas and military objects used for disaster relief. The Order provides its justifications that there have been many cars and other objects kept in tax free areas and free trade areas for several years. Anyone who imports new cars according to tariff type 8702 and 8703 and keeps them in a tax free area or free trade area for not less than two years or not less than two years all together, shall use the car or sell it while paying correct tax or shall export it from the country within 90 days. New cars can be kept but not for more than two years. Moreover, 176 fire trucks, rescue cars, light providing cars and trucks imported through Leamchabang Pier on 27 January 2006 and 139 cars/trucks on 6 February 2007 shall be considered military objects that the importers have taken in the country for disaster relief purposes according to the law on the control of military objects. They shall be exempted from paying tariff. 2 September 2016, the Head of NCPO has exercised power under section 44 to issue Order No. 52/2016 on the seventh list of government officials who are being scrutinized. 21 officials including civil servants, police officials and local administration official are on the list. The Anti-Corruption Center has to inform reasons to scrutinize those officials to their office so that their supervisor can appoint fact finding committees which need to present the finding within 30 days. If the officials are not found guilty, the committee has to inform the Center. The Head of the Center shall set up a group of three to five persons, who may or may not be civil servants and who have no interest or relations with the accused officials and have not investigated this issue. The group shall inspect and compare the previous finding within 30 days. If they do not find any fault, the accused officials shall be compensated and posted to work in different positions with the same rank but outside the previous area. 9 September 2016, Head of NCPO has exercised the power under section 44 and issued two orders. NCPO Order No. 53/2016 concerns third additional measures on illegal fishing, lack of reporting and lack of monitoring. The Order states that any person who owns or possesses a commercial boat without a license or with a license but does not have fishing license, must inform where they park their boats in writing to the Director of Regional Harbor Office of the area within 15 days. The Department of Harbor has authority to declare that they do not temporarily register boats. The Department may prohibit the owners or possessors of commercial boats from transferring staff on the boat while they are at sea fishing unless it is for safety or if there is a conflict. If the owners or possessors violate the order, they will be fined between 400,000-800,000 baht for one person and one boat. The Director General of Department of Fishery or Department of Harbor may consider fines for the offences under NCPO Order 10, 24 and 42/2015. NCPO Order No.54/2016 relates to appointments of honorable committee members in the education council, the Royal Police Cadet Academy, and human resource management of police institute. The Order states that since the committee members’ four-year-term is coming to an end, in order to improve the management of Cadet Academy and to have a smooth transition, these important orders are issued 1. Announcement of the Office of the Prime Minister on the appointment of the head and honorable committee members of education council of the Police Cadet Academy dated 8 November 2012 and other relevant announcements. People holding those positions before this NCPO Order entering into force shall be removed from their positions. 2. The new committee shall be comprised with committee by positions according to section 10 (2)(3) and (5) of the Police Cadet Academy Act 2008. The lists of newly appointed head and honorable committee members of education council which does not to follow procedure under section 10 and 11 of the same Act are Supachai Yawaprapas, being the head of education council. These following nine people shall be honorable committee members of education council – Phathaichit Eakjariyakorn, Jakrathit Thanakom, Montien Jareonphol, Pol.Lte.Col. Kasemsan Chotechakornpan, Pol.Capt. Sutham Cheuprakobkij, Pol.Col. Narat Sawetnun, Pol.Lte.Gen. Umporn Jarujinda , Col. Settapong Malisuwan and Kamon Rodklai. 12 September 2016, the Head of NCPO has issued NCPO Order No. 55/2016 which concerns some cases under jurisdiction of military courts. The Order revokes jurisdiction of military court over civilians according to NCPO Order 37/2014, 38/2014 and 50/2014. NCPO Order 55/2016 covers any crimes which takes place after the entry into force of this order and the Court of Justice shall have a jurisdiction over those crimes. Examples of crimes in those orders are offences against monarchy (Section 107-112), offences against internal security (section 113-118) and offences concerning weapons such as guns, bullets or explosive objects which are used only in war and the registrar may not issue a license. With regards to cases that have already been in military court, whether or not the offences took place before this NCPO Order and offences under Military Statue law shall remain under military court jurisdiction. Moreover, the officials under NCPO Order 3/2015 and 13/2016 shall continue to have power to arrest, search and detain a person. 14 September 2016, the Head of NCPO has issued NCPO Order No. 56/2016 on the protection of agriculture products under care of the government and on legal action against corrupt individuals. The Order states that government officials managing cassava or corn products and the Legal Execution Department shall have power to exercise administrative execution measures against corrupt individuals under the Government’s Rice Scheme Project since the production year of 2005/2006 until 2013/2014, Cassava Intervention Project, since the production year of 2008/2009 until 2012/2013 or Animal-Feeding-Corn Intervention Project of 2008/2009 that Administrative Courts had already delivered judgement. 15 September 2016, Head of NCPO has issued NCPO Order No. 57/2016 on the improvement on management of Southern Border Provinces (SBP). According to the Order, the Prime Minister has power to appoint honorable persons with experience in solving problems in the SBP, as a special representative of the Government. The representative has a duty to coordinate the Cabinet, central government and local offices. He/she shall be a committee member of Steering Committee to Resolve Problems in SBP. The Committee has duties to provide suggestions but not to make final decision. The Committee shall receive the same remuneration and privilege as representatives of Thai trade and committee of deputy minister. NCPO Order No. 58/2016 concerns public health service for disabled people. According to National Health Security Act and Social Security Act, disabled people are insured under the Social Security Act. They shall have the right to receive public health services with standard and efficiency indicated in National Health Security Act. The expense paid for disabled people shall be from Social Security Fund. It shall not be paid from funds under section 21 of the Social Security Act. 27 September 2016, the Head of NCPO has issued NCPO No. 59/2016 on the eighth list of government officials who are being scrutinized and the improvement of human resource management in some government units. According to this Order, 72 police officials and staff of local administrative organization are suspended from their job. Most of them are staff from local administrative organization of Mahasarakam Province. This Order has also appointed Major General Sansern Kaewkamnerd, expert of the army and spokesperson of the Office of Prime Minister to temporarily act as a director-general of Department of Public Relation and Office of the Permanent Secretary of Prime Minister Office. 28 September 2016, the Head of NCPO has issued NCPO Order No. 60/2016 on preventive measures to bring wild elephants to subrogate as domestic elephants. The objective is to protect Thailand’s import and export of wild animals and wildlife from being suppressed under the list of the Convention of International Trade in Endangered Species of Wild Fauna and Flora or CITES. The Head of NCPO has ordered that domestic elephants, both registered or unregistered, to have their blood collected for DNA. The objective of this process is for an issuance of certificate and ID for elephants. The blood collection shall be finished in 180 days and the Administrative Department shall record descriptions of elephants in 360 days. If the owners of elephants do not comply with the timeframe, such elephants shall be considered property of the State. Moreover, relevant ministries shall draft a law to establish measures to protect elephants within 90 days. 6 October 2016, the Head of NCPO has issued NCPO Order No. 61/2016 on the resolution on problems caused by the shortage of aviation personnel. The Order indicates that contracts for pilots, pilot teachers, and air traffic controllers shall be in accordance with criteria, methods, and conditions set up by each state enterprise. The contracts should be comprised of job descriptions and remuneration or benefits of staff which will be enforced between 1 October 2016 to 30 September 2019. After that period, qualification and incompatibility shall be according to that state enterprise and the law on standard qualification for committee members and staff of state enterprise. On the same day, the Head of the NCPO has also issued NCPO Order 62/2016 on the reform of country’s research and innovation. The National Council on Research and Innovation is established and the Prime Minister shall be the president of the Council. The Council has duties to establish direction and policy of relevant government offices working in research and innovation system of the country to be in the same manner. The Council plans the roadmap, policy and strategy of the system. Furthermore, under this Order, the Head of NCPO has dissolved National Research Council of Thailand, executive committee, academic committee, national committee on science policy, technology and innovation and national committee of improvement of innovation system. Their power and duties shall be transferred to the National Council on Research and Innovation.